Rostoker & Monkhorst, the near famous physicists who are chasing an idea for fusion using an interesting if bewildering containment vessel have been granted a patent that has more information that may – or may not – present clues as to the progress of the group’s research and development. A little background from what is generally known. Rostoker & Monkhorst have accumulated a deep grasp of one path to confining fuels for the purpose of compelling fusion. The newly granted patent for the topic is an older filing that’s owned by the University of California. Its worthwhile to keep this in mind as private investors joined with Rostoker & Monkhorst forming the company TriAlpha Energy. Some years have passed since the investors began their backing of the professors’ efforts, thus the information is very dated. Whatever have been learned since is likely privately held intellectual property and the new patent may well be significantly out of technological date. But the patent offers considerable insight for the curious as to the direction and general basis for the group’s work. The patent discusses the background going back as far as the Jassby et al, Farnsworth, Hirsh, Limpaecher and Bussard until the accidental discovery about 1960 of the ‘field reversed configuration’ at the Naval Research Laboratory. This is where Rostoker & Monkhorst diverge out from the early research heading straight off into the field reversed configuration path. It’s also where the bewildering part comes in. 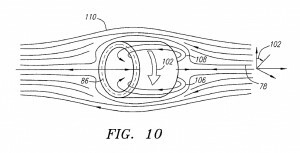 Rostoker & Monkhorst are working and the patent describes a device that simultaneously achieves electrostatic confinement of both the fuel’s electrons and magnetic confinement of the fuel’s ions. This basically – sparing a long explanation and an apology is included here – keeps the “whole” of the input energy within the device. Rostoker & Monkhorst believe when the device is built the configuration will provide adequate density and temperature such that as ions collide they will fuse together so releasing fusion energy. Rostoker & Monkhorst are asserting the device confines the ions in an orbit in a magnetic field and the electrons are electrostatically held into an energy well. With that in mind, the magnetic field could be tuned to produce and control the electrostatic field. Moreover, Rostoker & Monkhorst believe the tuning can achieve electron velocity in the same direction as the ions. The point is to get to an aspect where an annular plasma layer is contained within a field reversed configuration. Then positive charged ions and the electrons would be caused to rotate. When positively charges ions rotate the idea is to “form a self field of sufficient magnitude to cause the field reversal.” That’s the ‘Bewilderment Time’. A demonstration, perhaps an animation would be needed to see this. If that turns out to work in practice the bedeviling electron escapes with large energies would be contained in the system. The patent pdf offers a challenging, and state of the art at the time the patent was filed, explanation of the device function. Whether the concept of field reversed configuration will get to an engineered device isn’t known. Its reported some $40 million is committed from private investors that could well be enough for a functioning device. This writer remains a bit bewildered – just where in the device an atom is going to fuse with another isn’t clear. Somewhere a fuel has to fuse. Some energy has to be imparted and observed with heat or velocity or pressure to overcome the atomic forces that keeps atoms apart so they don’t fuse spontaneously. The fundamental event isn’t being explained. Saying the “collisions between ions of different velocities lead to fusion reactions” isn’t getting to projectable event counts and leads to the belief that the inventors expect fusion through out the rotational field (notation 106 in the graphic). Oh My. . . Which leads to the writer’s thought that Rostoker & Monkhorst have an elegant proposal that brings excellent solutions to difficult problems. Yet getting a concentration of fusion energy release to match and exceed the energy required to get and keep a system running is still very much a major engineering problem. It may well be possible to devise a workable or efficient system – yet the matter of just how and where the fusion happens remains an elusive explanation. Single Dime to the Power Company! Hey excellent blog!!! Man .. Beautiful .. Incredible .. I will bookmark your website and go ahead and take feeds also great article thanks Hi. I needed saying thanks to you for that fantastic information you have posted on your site. I’ll definitelycome returning to check it out once again and have subscribedto your RSS feed. Use a fantastic day.